What is the difference between low back pain, lumbar pain and lumbago? Lumbago is simply another term for a non-specific low back pain or discomfort that occurs in the lumbar portion of the spine, ranging from mild to severe, sharp to dull, occasional to constant; sudden to gradual onset that may or may not radiate pain into the buttocks or legs. It is not a descriptive term and can be used regardless of the cause of the lower back pain. In fact, lumbago is a preferred term by some clinicians when the cause of the problem is unknown. It may also appropriately be used to refer to the general feeling of achiness and uncomfortable stiffness of the back upon getting out of bed in the morning. The term lumbago appears to be falling out of popular use, at least in the United States and still continues to be used in other parts of the English speaking world. The phrase “lower back pain” is much more commonly substituted for lumbago in the last 30 years; still the two terms are often used interchangeably. Lumbago or lower back pain can arise from a variety of problems. While a diagnosis is always difficult to make and often an educated guess, the cause of lumbago can be suggested by the speed of onset of complaints. Using this information can help determine the cause and point to the correct treatment. Correct treatment of lumbago and back pain relief is completely dependent on determining the cause of the problem, which has been described as diverse and multiple possibilities. Bed rest if severe or limited activity based on the degree of pain. A very comforting and helpful posture to rest the low back is to lie on the back on a firm surface with the knees bent and legs elevated slightly (as when placing two stacked couch cushions below the lower legs) so the low back can rest in a slightly flattened posture. Acupuncture or acupressure can be extremely effective. Many times lumbago is caused by or contributed to when the muscles, discs, ligaments and tendons do not fully support the low back spinal vertebra, causing the nerves to become pressed upon, or compressed, resulting in what some people would call a pinched nerve. There are simple and effective treatment measures a person with a pinched nerve can do that can be very helpful in many cases. Review some of these ideas for pinched nerve lumbago treatment to learn how to help yourself and reduce or eliminate lumbago. Most often the cause and the course of lumbago are unremarkable, with about 75% cases of routine low back pain never receiving a specific diagnosis to explain the origin and nature of the problem. In these cases the cause remains unknown and is assumed to be a low grade soft tissue problem involving the structural elements of lumbar spine and pelvis. Even so, sudden worsening and new superimposed problems can develop in these cases resulting in an sudden emergency situation. Following a faithful exercise routine of low back stretching and strengthening exercises will go a long way toward eliminating or at least reducing the majority of lumbago cases. Exercise is not the best course of action to take while in the acute and painful stages of lumbago, however. At this time rest, ice and NSAIDs are most commonly effective. Once in the non-acute state a well planned program of low back conditioning will often help considerably. Additional benefit will be gained in most cases by stopping cigarette smoking, losing excess body weight and correction of any ergonomic problems known to exist in the home, workplace, automobile and anywhere else much time is spent. 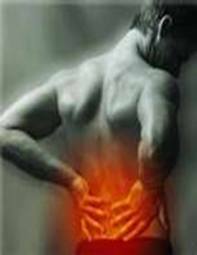 Chronic low back pain and frequent episode of lumbago do not have to be a way of life.